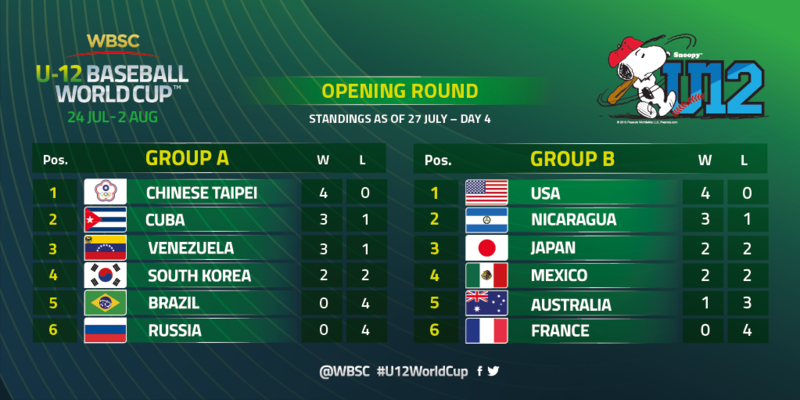 TAINAN, Taiwan – Three National Teams have made early reservations into the second round of the 2015 U-12 Baseball World Cup, with host Chinese Taipei, defending U-12 World Champions United States and Nicaragua having booked their spots on Monday -- one day ahead of the final day of Opening Round competition (Day 5) on Tuesday, 27 July. Five countries will be battling on Day 5 for the pride of their nations and for the three remaining spots into the “Super Round”, guaranteeing an electric finish to the Opening Round. On Monday, the Chinese Taipei and the United States National Teams used five-inning knockouts to defeat Russia 14-0 and Australia 13-1, respectively, to secure a place and a future head-to-head encounter with each other in the Super Round. Chinese Taipei will be the top seed from Group A, while the U.S. will be the top seed out of Group B. Starting on Thursday, the top three nations from Group A will collide with the top three nations of Group B in the Super Round. Records will carry over from the Opening Round and the two nations with the best overall records will compete for the U-12 world championship on Sunday, 2 August. Nicaragua, the 2014 U-12 Americas champions, also punched their Group B ticket into the Super Round on Monday, by defeating Mexico, 7-4. With Japan’s 21-0 win over France Monday, the U-12 World Cup stage is set for a winner-take-all battle between Japan and Mexico on Tuesday. Both are 2-2 in Group B, and the winner will rise to become one of the six “Super” nations, while the loser gets sent to the 7th – 12th place Round. 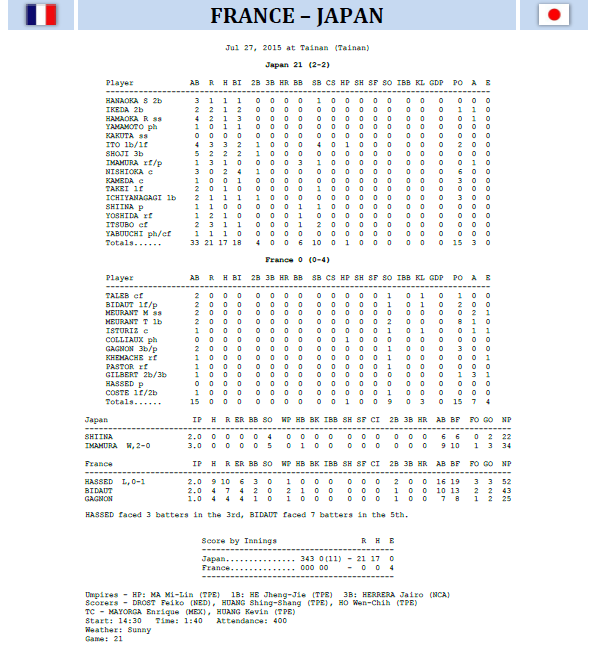 Trailing 3-2 in the bottom of the sixth inning on Monday, Venezuela pounded three straight hits – a single, double and another single, circling the bases for two runs -- to leave the S. Korean National Team on the field. The 4-3 victory for Venezuela puts them in prime position to claim a one of the two remaining Group A tickets into the Super Round, but the Venezuelan National squad will have to get past unbeaten Chinese Taipei on Wednesday evening, under the lights of Tainan Municipal Stadium. Three nations in Group A -- Cuba, S. Korea and Venezuela -- will be vying for the two remaining spots to advance to the Super Round. 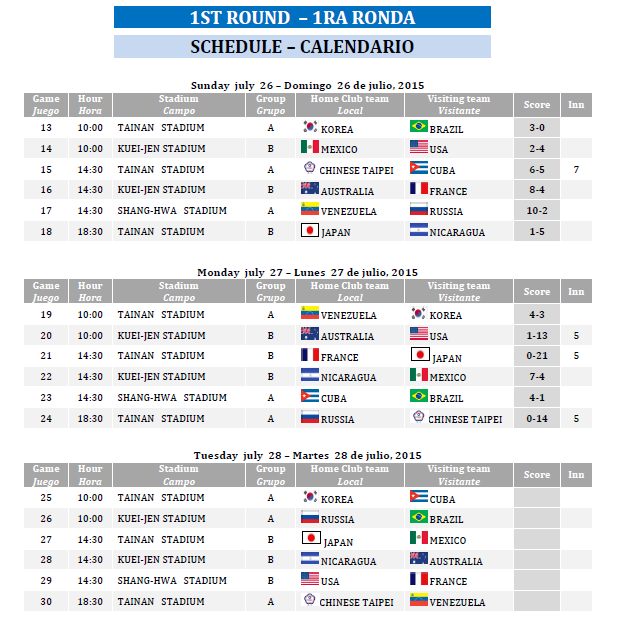 A win by Cuba against S. Korea on Wednesday would guarantee that Venezuela will be among the three nations advancing from Group A. Cuba defeated Brazil, 4-1, on Monday to improve its record to 3-1 – the same as Venezuela. If Cuba, S. Korea and Venezuela all finish with a record of 3-2, WBSC Tournament Officials would have to go to the scorecards to break the tie in Group A. The weakest nation “on paper” would be sent to the 7th -12th place Round. In total, 50 international contests are scheduled in Tainan to determine the 2015 U-12 World Champions.